Nothing is worse than coming to the anime party late, especially when someone has recommended a series to you. Then you go into JB Hi-Fi or Minotaur Books and discover that there are several volumes of that series available. Curses you think as you balance living expenses with enjoyment inside your own wallet universe. What to do? The answer is simple thanks to Madman who have catered for those doddering collectors who procrastinate and this is where the Darker than Black Collection comes into play. With 650 minutes of animated goodness, this collection bounds together all 26 episodes of this amazing anime series that could be considered a cross between Heroes meets the X-files, with a healthy dose of intrigue and violence thrown into the mix. The story of Darker than Black is set in the not so distant future in a world where certain people have been given powerful psychic abilities due to the appearance of the "Hell's Gate" in Tokyo. Like the eclipse in Heroes, the Hell's Gate has given some people, superhuman abilities that can either be used for good or evil. However unbeknown to the public, these people are called Contractors and are being monitored by the government in order to ensure that their powers are kept in check. The key to the series is that these Contractors must "pay" to use their powers, generally through self mutilation or some other obsessive task. For example, using your power may cause you the inability to tell a lie or you might lose the movement of a particular body part. Needless to say, the repercussions are strange and totally left out of centre. The series revolves around Hei, one of the world's most powerful Contractors who is only known as BK201 and is assisted by his companions, the blind doll Yin and Mao the talking cat. The reason why Mao talks is that he was once a contractor and his price was to be transformed into a cat. Even though the storyline feels like it has been taken directly from a Manga story due to the mix of superhuman powers and that of the supernatural, it's actually quite an adult orientated story with some quite powerful themes. Featuring action, drama, mystery and even a twinge of romance, Darker than Black is a very cleverly written story of absolute power corrupts absolutely. To keep in line with the story, the characters in Darker than Black are quite interesting and dynamic, whether it's the dark Hei who keeps his secrets close to his chest or the blue haired Yin who plays the Ying to Hei's Yang. Of course, for comedic value, the talking cat is definitely a strange creature from Anime lore but gives the story a very interesting focal point of the powers that these humans wield and their repercussions. I haven't been this intrigued by an anime series for ages and even though people may call this Cowboy Bepop, you'd actually be wrong because this series has enough content to strongly stand its own. There are a few slow moments in the series but more often than not, the story finds its footing and starts running again. In terms of graphics, the animation is quite impressive and "dark" for this series that uses great character designs and some impressive background environments that goes hand in hand with the majestic musical score by Yoko Kanno. The Western voice acting is quite subdued and suits the characters perfectly, each with their own powers, motivations and connections to the greater story. In conclusion, I was a little apprehensive with the start of the series but after a few episodes, I was hooked and if Heroes was as well written as this... well, let's just say it would have some more fans! 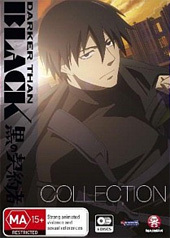 With decent animation, one of the most original and clever stories for quiet some time, the Darker than Black Collection is a must have series for anyone's anime collection.